There are plenty of budget hotel and bed-and-breakfast options to be found in Sochi, both centrally and peripherally located. Their interiors vary from a skin-deep improvement on the Soviet times to manifestations of the owners' personal fantasies. Signs announcing rooms to let can be seen on every corner. 1. Riviera Hotel is located in central Sochi, by the city's only sand beach of the same name. The rest of the Sochi beaches are shingle. Riviera offers inexpensive but cozy rooms decorated from floor to ceiling with azure tiles. Each room has air conditioning and comes with a shower, which is something not every Russian two-star hotel can boast. An eatery across the road serves lunch and dinner. Numerous restaurants, which offer live music and gypsy singing until late in the night, are within walking distance. Additional services: express check-in/check-out, laundry and pressing service. 2. Surprisingly low prices are offered by the Villa Bossa guesthouse in central Adler. Its bright single, double and triple rooms have TV, fridge, and bathroom. Skis and other sporting gear can be dried and stored in a special room. The guesthouse has a small grocery store selling cheese, sausages, bread, fresh dairy products, juices and alcoholic beverages. There are inexpensive restaurants and cafes nearby where you can try tasty food and enjoy live music. The guesthouse does not take credit cards. Visitors praise the owners, Yelena and Fedor, for their eagerness to help: they will advise on the best transport to take to the city, provide tips on how to avoid mercantile taxi drivers, suggest the best excursions and beaches, point you to sources of genuine homemade grape wine and the best shaslik barbeque in town. Additional services: counter manned 24/7, express check-in/check-out, gift shop. 3. 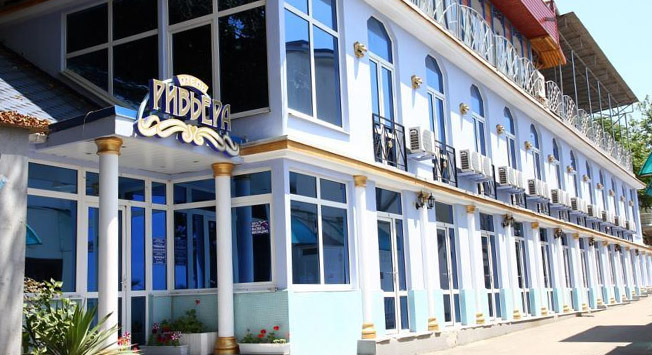 Hotel Palma is located right on Kudepsta beach, just 15 minutes walking away from Russia's largest oceanarium. The place is within a 15-minute drive from either Sochi or Adler, and is relatively close to Krasnaya Polyana. Each standard room, junior suite, and suite is equipped with a minibar and a TV set. The hotel's restaurant and bar operates until late into the night, offering traditional Russian cuisine and staging merry friendly parties in the evenings. The water in the swimming pool is maintained at +28°C even in winter, and the air is sweet with the odour of flowers planted around the hotel all year round. Additional services: counter manned 24/7, room service, pressing service, honeymoon suite, air and rail tickets on sale. 4. One hotel worth checking out in Krasnaya Polyana is Piramida . Veteran tourists say it offers the best price-to-quality ratio. The hotel, surrounded by picturesque mountains, sits close to the primary skiing resorts and chairlifts. There is a genuine wood-fired bathhouse and a tiny swimming pool on the first floor. Skis are offered for rent. Personnel will organize fishing trips or horse-riding sessions for you. You can spend the evening playing billiards or sipping a glass of wine in the bar. There is a grocery store, a dining hall, and a restaurant not far from the hotel. Additional services: counter manned 24/7, fax and copying machine. 5. The Four Peaks guesthouse is located in the settlement of Est-Sadok not far from the Olympic facilities in Krasnaya Polyana and is surrounded by picturesque mountains. All rooms are decorated with genuine wood and each has a TV set and a bathroom. Personnel will be happy to organize fishing, skiing and horse-riding trips. There is a transfer service to skiing centers, and the guesthouse runs its own skiing school. The restaurant, with its huge fireplace, serves an assortment of beers, strong spirits and grilled dishes. Wine lovers will appreciate the vast cellar with local wines. The hotel has a small spa center with massage, sauna, aromatherapy bath, cold mineral-water bath, the ancient Russian method of rubbing massage, and herbal teas. Additional services: counter manned 24/7, room service, laundry, dry cleaners, and pressing service, honeymoon suite, takeout lunches, car rental, sightseeing tour booking, fax and copying machine, concierge.